Peter Sprague | How Can You Catch the Sparrow? I’m not sure how you can catch the sparrow but I’ve loved this music forever and it still rings as true as ever. 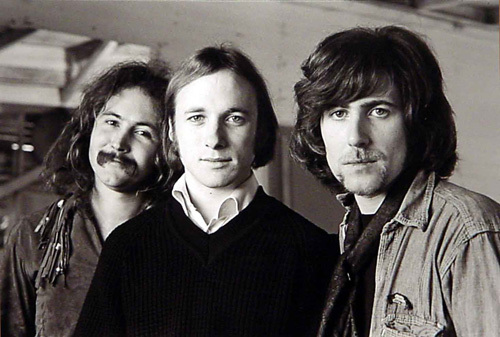 For me it goes miles beyond the lyrics; it’s the vocal harmonies, the Sixties vibe, the acoustic guitars, the whole Crosby Stills & Nash universe filling the air and making it’s way into your heart. All of this CSN immersion comes today ‘cuz I’m heading out to Del Mar to hear the band Back to the Garden play the music of Crosby Stills Nash & Young. They asked me to sit in and play “Suite Judy Blue Eyes” and I’m thrilled. O va, o va! For all of last week my family and I unplugged from the hurricane and joined family members for a beach vacation right on the sand in Oceanside. Lots of swimming, beach walking, food forever, hot tub scorching, sand in the bed, sand in the food, and endless images of sharks on the TV. Wicked combo and we had a ball! And then we took a hike into the magic serenity of Torrey Pines park. Life is good! 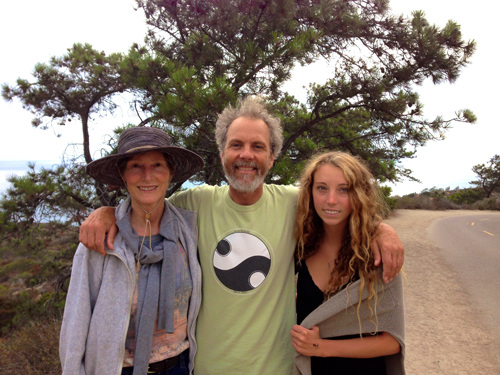 Hike to Torrey Pines with Stef, Peter and Kylie. 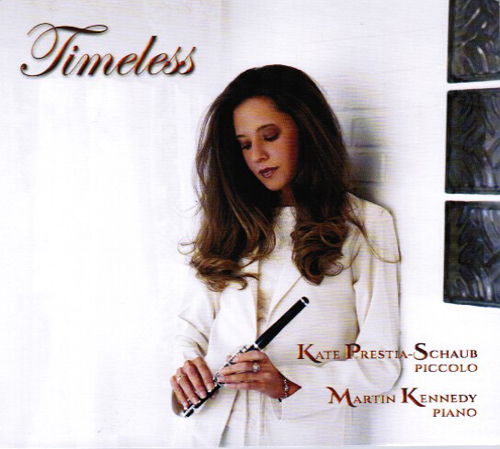 Just out, beautiful music by Kate Prestia-Schaub on piccolo and Martin Kennedy on piano on their new CD Timeless. This is a project that we recorded at SpragueLand a couple of months ago and these two gifted musicians have selected a wonderful blend of music for this outing. Their style is modern classical with the pieces ranging from the gentle to full on zillions of note extravaganzas with wild rhythms and virtuosic leaps and bounds. Fantastic! Their level of playing is of the highest order and they were a hoot to have in the studio. Click here to hear some samples and learn more. Cooking for this week is a solo Roxy hit on Thursday. I’m back and the revolution of summertime in Encinitas is in full swing. See you there! 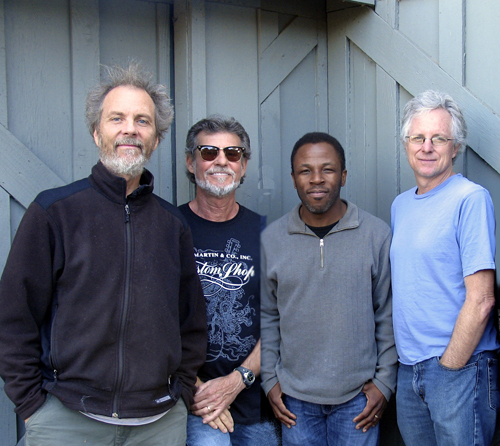 On Saturday I’m thrilled to be connecting with Tripp, Leonard, and Gunnar for a show in beautiful Rancho Santa Fe. 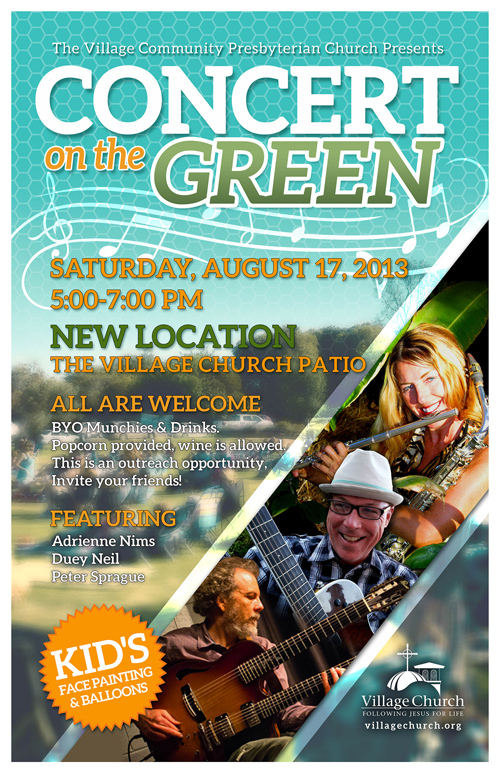 The Village Community Presbyterian Church is sponsoring the Concert on the Green and our group opens up the show. Look to the gig calendar for details and hope to see you there. Quartet music with Peter, Gunnar, Leonard, and Tripp. Back in the 80’s I recorded an album for Xanadu Records called Bird Raga that included Bob Magnusson, Bill Mays and Jim Plank. We we’re a working band and had a lot of gigs under our belt. I wrote this bop tune called “Bird Raga” and if you know anything about Indian music, their pieces are called ragas. The songs drone out in one key or scale and set up a particular mood. My tune jumps to a bunch of keys and chord changes and could be a raga that Charlie Parker might of played had he ever ventured off to India. The tempo is up and the boys are playing! Check it out here! !